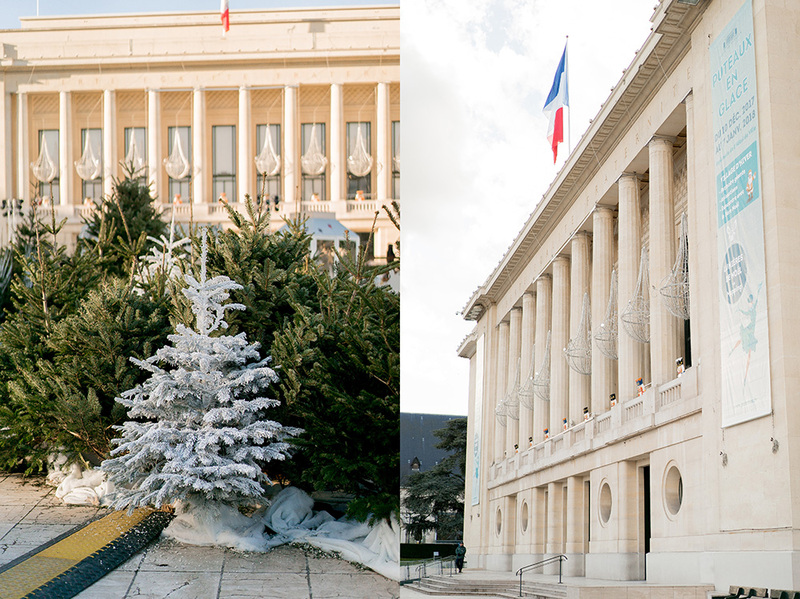 An intimate mairie (townhall) ceremony in quaint Puteaux on one Saturday to legally bond Kim and Anthony in matrimony in France, followed by a religious ceremony one week later at the American Church in Paris, two dresses, and one perfect couple equals a recipe for a lovely Paris wedding! When it was time to begin, their intimate group of guests, took a seat along the benches. Kim and Anthony walked in hand-in-hand and took a seat in the two oversized chairs, in front of a large desk, that reminded me of a more informal judicial desk. A few French representatives waited at the front to oversee the ceremony. The officiant wore a French sash across his body. In France, due to the separation of church and state, it’s a legal matter and not a matter of the church when someone gets married. To get married in France legally, it is required that the couple first marry in the town hall, but then they can also have a ceremony elsewhere if they wish to as well. The formalities were all happening in French, but to my pleasure, I was able to follow along quite well. I heard the officiant reading aloud the precise laws dealing with marriage, I surprisingly recognized plenty of terms from my civics class. Yay! I learned more than I realized. After the legal formalities, Kim and Anthony exchanged rings and sealed the deal with a kiss! And then, just like that, they were married. Their family and friends quickly surrounded them with congratulatory hugs. And of course some photos were taken with family and friends. Afterwards, they went out to celebrate at a local restaurant. This wedding scenario is the norm here. Less muss, no fuss … much more laid back than what we are accustomed to in the U.S.
Kim was excited that her parents, sister and niece were able to stay around for the full week to be here for the ceremony at the American Church in Paris the following week. This wedding day looked more traditional in the sense of what we are used to back home. A traditional wedding dress, a bridesmaid, a flower girl — of course it goes without saying — a groom, a church, a preacher, some readings, and a celebration after the I do’s were said. On this day, the party continued at Les Ombres — which I have to say is quickly becoming one of my favorites! It’s part of the Musée du Quai Branly. It has an incredible, elevated view of the Eiffel Tower, and the food is delicious! It was so enjoyable to spend the afternoon with their guests. It was a blending of not only two families, but of two cultures. Yet somehow, everyone managed to communicate and laugh with one another despite the fact that everyone wasn’t bilingual. Kim’s father is known for his fun games he likes to incorporate into special events. He had everyone take a quiz about the bride and groom in true newlywed fashion. One of Anthony’s friends stood beside her father, translating everything as he spoke into French. It was one of the funniest parts of the afternoon as gaffes were made, which spilled out into shared laughter by everyone present. And isn’t that what a wedding celebration is all about? Love and laughter with those we hold dearest to our hearts. Kim and Anthony, thank you for having us! It was an honor!